GREAT NEW REVIEW BELOW! Click the image to buy! School Librarian’s Workshop, formerly a print publication, became a digital only publication with the August/ September 2011 issue. It continues to be a bi-monthly newsletter serving K-12 school librarians and the varied and changing needs they face. Subscribers can click on the many web links throughout each issue rather than having to tediously re-type them, as well as print the entire issue in a pdf format. For more information on what you can find in this newsletter – click the “about slw” tab at the top of this page. The School Librarian’s Workshop is here to be indispensable to your library program – just like you! Our mission is to be your library program’s silent partner, keeping you informed, inspired, and invaluable – a leader in your building – indispensable to your students, teachers, administrators and community. Synopsis: “New on the Job: A School Librarian’s Guide to Success” serves as a comprehensive and ‘user friendly’ instruction manual for the new school librarian. 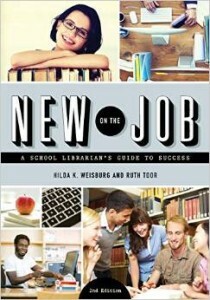 From job search strategies and discovering work philosophy to the nitty-gritty details of creating acceptable use policies, this revised and updated edition, which includes a new foreword from Sarah Kelly Johns, shares the joys and perils of the profession along with a wealth of practical advice from decades of experience in school library programs. With this guide as a roadmap, new school librarians can: Tackle the job search with confidence, with tips on everything from polishing a resume and acing a job interview to ways of handling any potentially negative Google results and other digital footprints; Learn the secrets to successfully collaborate with teachers; Navigate new roles and responsibilities through orientation and organization; Create dynamic interactions with students to deepen their learning experiences; Master the art of communicating with the principal, IT experts, and vendors; Become familiar with school library technology, including e-book collections, online databases, and library management systems; Receive field-tested guidance on daily matters from budgeting and purchasing to advocacy and programming. The AASL Standards for the 21st-Century Learner, Partnership for 21st Century Skills, and Common Core State Standards are also thoroughly discussed. New school librarians as well as those already in the profession can set the tone for rewarding career with this one-stop, hands-on guide. Critique: Now in a newly updated and expanded second edition, “New on the Job: A School Librarian’s Guide to Success” continues to be the ideal instruction manual for novice school librarians, K-12. Informed, informative, and impressively well written, organized and presented, “New on the Job: A School Librarian’s Guide to Success” is an excellent and highly recommended addition to personal, professional, and academic library ‘Library Science’ instructional reference collections. 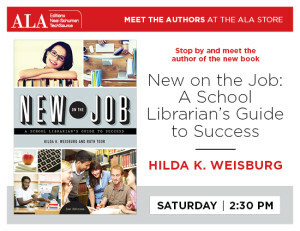 It should be noted that “New on the Job: A School Librarian’s Guide to Success” is also available in a Kindle edition ($40.00).